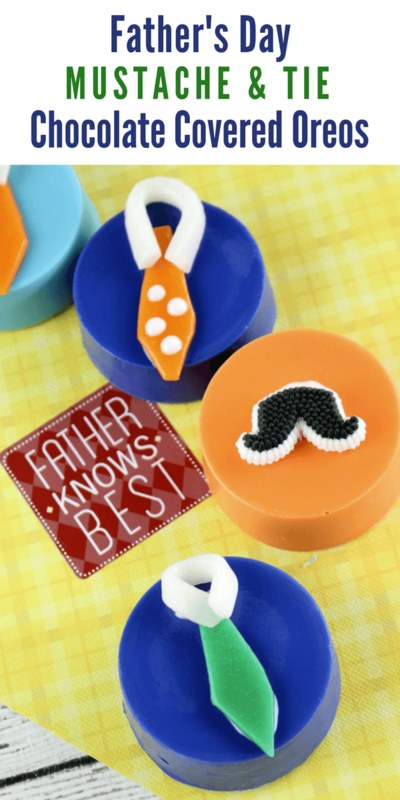 Decorated with mustaches and ties, these Father's Day Chocolate Covered Oreos will make the perfect no-bake treat for dad this Father's Day. 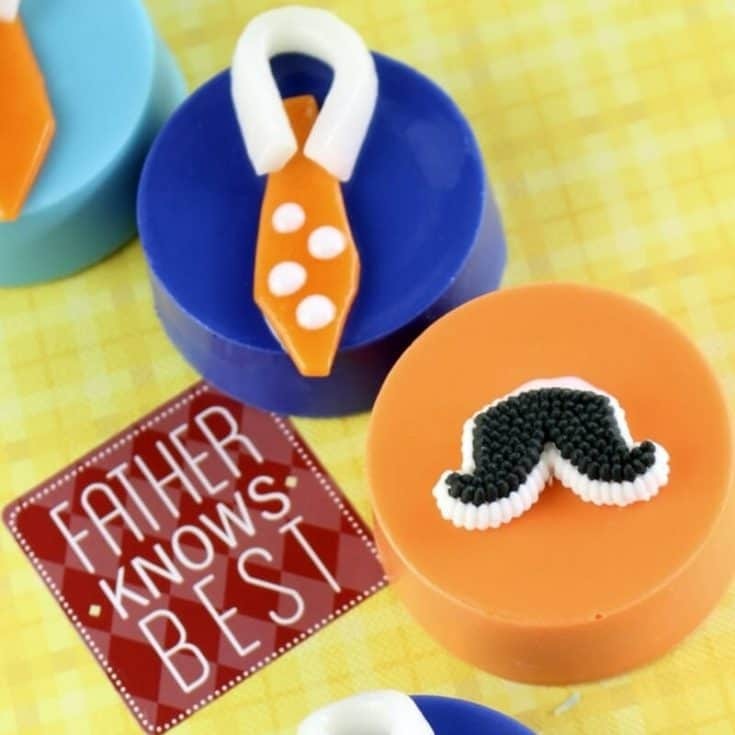 Dad will love these Father's Day Chocolate Covered Oreos, as will the rest of the family. I mean, who doesn't love a delicious chocolate covered Oreo cookie? They are the ultimate indulging treat, plus they are super simple to make. Best of all, there is no baking necessary. Below you will find a list of the ingredients and special supplies that you will need to make these adorable Father's Day Chocolate Covered Oreos. Links to purchase ingredients on Amazon are provided for your convenience as well. In a microwave safe bowl, microwave the royal blue candy melts for 45 seconds. Stir until completely melted and smooth. 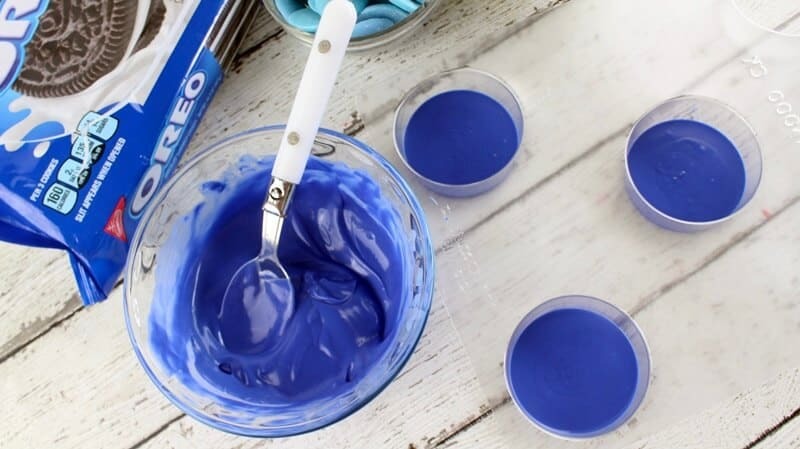 Pour 2 tablespoons of the melted royal blue chocolate into 3 of the cookie molds. Place an Oreo on top of the melted chocolate. Spoon additional melted chocolate on top of each cookie, up to the top of the mold. 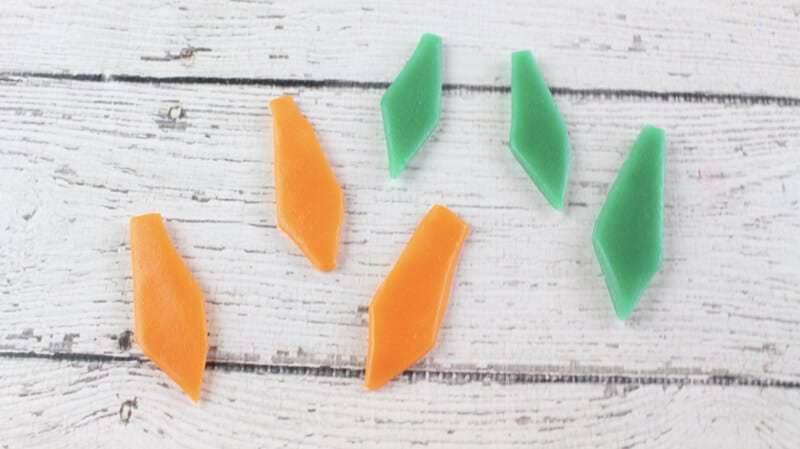 Repeat previous steps with the light blue, orange, and green candy melts. Then, place the cookie molds into the refrigerator and chill for 30 minutes to allow the chocolates to harden. Line a cookie sheet with wax or parchment paper. Gently pop the chilled cookies out of their molds and place on the lined cookie sheet. 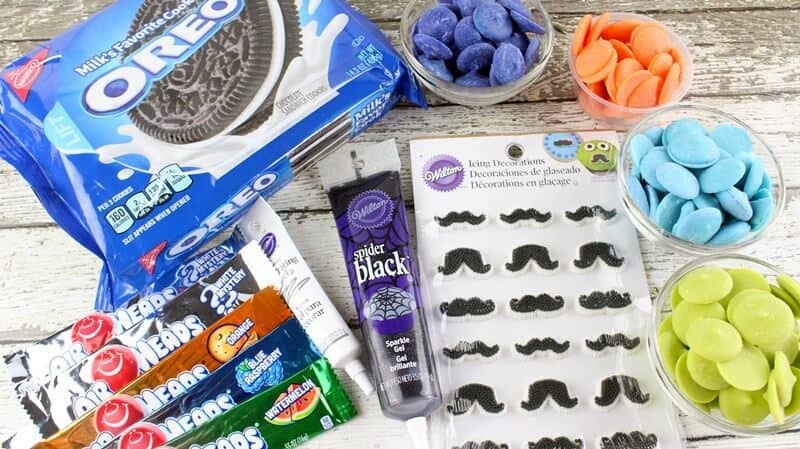 Apply icing gel to the back of 6 candy mustaches and place in the middle of 1/2 of the cookies. 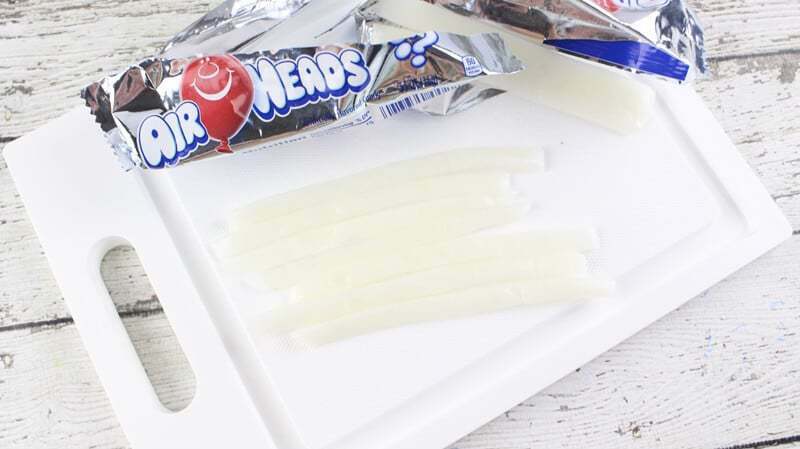 To make the ties, cut out 6 (1 1/2 inch long ) strips from a white Airhead. Use scissors to cut tie shapes from the green and orange Airheads. Fold the ends of each white strip forward and to the center like a collar. 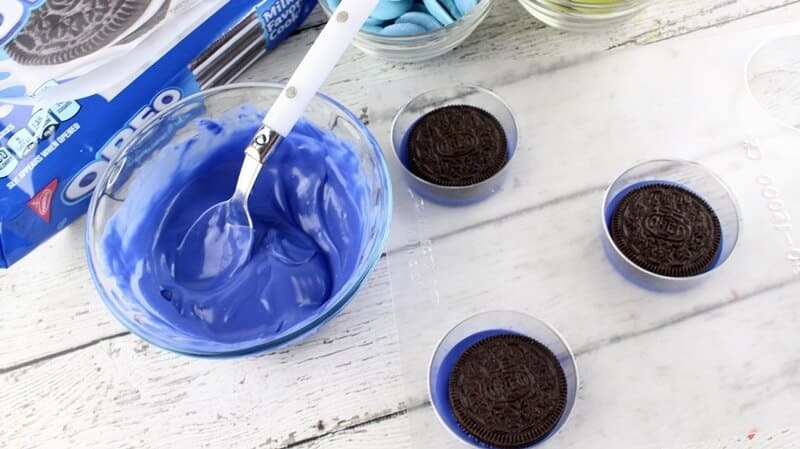 Apply icing to the top of the remaining 6 Oreos and press the collar down on each one gently. 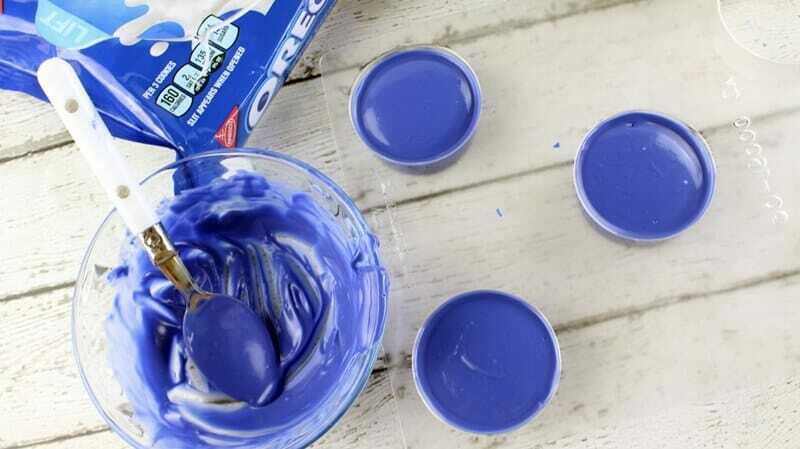 Apply icing down the middle of each Oreo and place a tie over the icing. Press down gently. 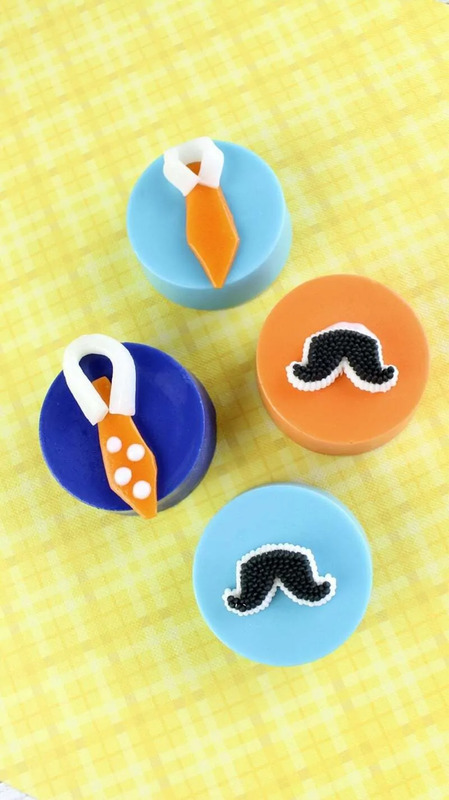 Feel free to decorate your ties with icing (think polka dots or stripes) or leave them solid in color. Pour 2 tablespoons of the melted royal blue chocolate into 3 of the cookie molds. Place an Oreo on top of the melted chocolate. Spoon additional melted chocolate on top of each cookie, up to the top of the mold. 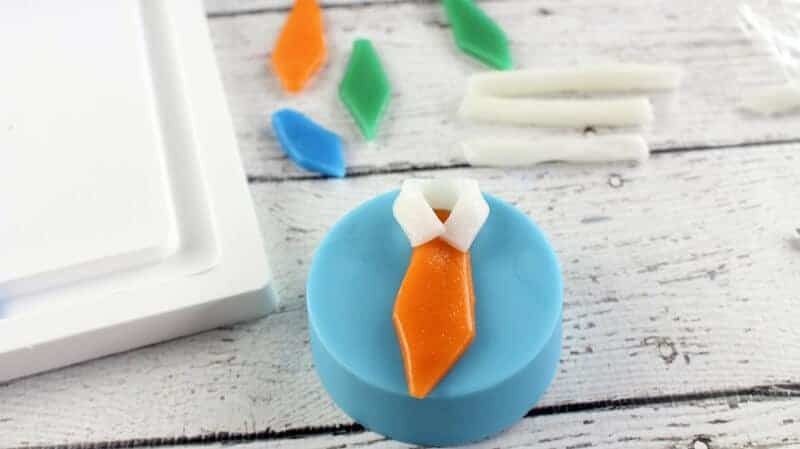 Repeat steps 1 & 2 with the light blue, orange, and green candy melts. 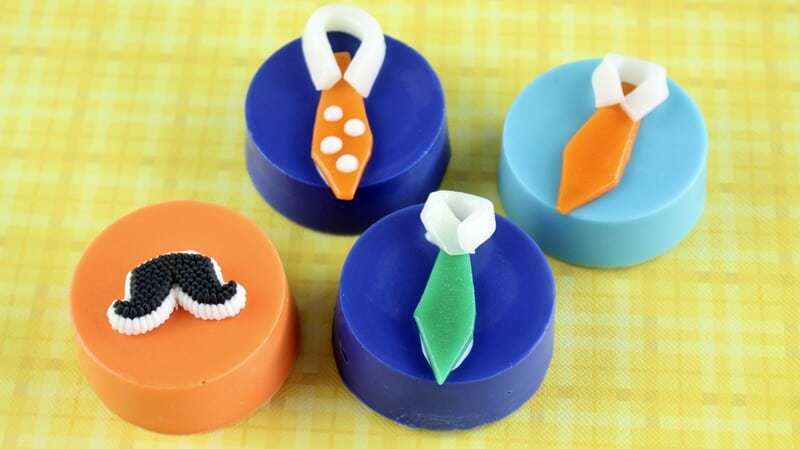 Place the cookie molds into the refrigerator and chill for 30 minutes to allow the chocolates to harden. To make the ties, cut out 6 (1 1/2 inch long ) strips from white Airheads. Use scissors to cut tie shapes from the green and orange Airheads. I hope that you enjoyed this Father's Day Chocolate Covered Oreo Recipe and that you are your family have a terrific Father's Day! If you are interested in checking out our other fun chocolate covered Oreo recipes, take a peek at these Heart Eyes Emoji Oreos, Pot of Gold Oreos, White Chocolate Valentine's Day Oreos, or these St. Patrick's Day Oreos. I’m not good at baking but even someone like me can make this. Thanks for sharing how you made the Father’s Day oreo. A great idea for the kids to make. Wow, these are so professional looking! I can’t believe how easy they are for how amazing look! 🙂 Thank you so much for sharing how to make these, my kids are going to love helping me! Thanks for the recipe, I will have to try this. 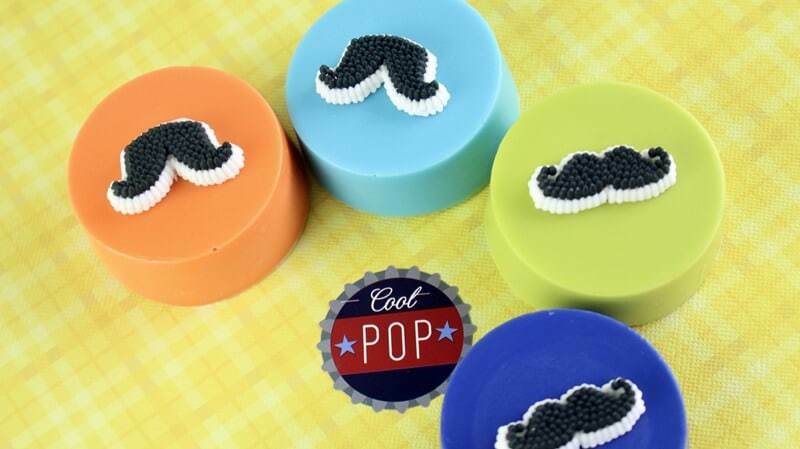 Those are so cute and perfect for Father’s Day. I can see kids helping make them, too. This recipe will be perfect for tomorrow. I really needed a new idea and this has me inspired. Thank you so much for sharing it!